after the release of the woodland maps it's time to start developing a tileset for a village in the woods. i already started a thread some months ago, but the response to my drafts wasn't that enthusiastic. so i thought it would be better to collect some ideas first before i start making anything. ...so... how would you like the village to look? how should the houses be build? what about the surrounding of the houses? any special objects you could think of? it would of course help a lot when you could find/create some pictures, drawings or (most prefered) screenshots from old games to show what you would like to see. Well your own tileset is the best reference at the moment: perhaps you could try to use hints of the elements and shapes you've used there as a referrence? Experiment on a few different things and be prepared for our feedback. I prefer the Secret of Mana style which has not as much details and colors as your tilesets (i'm refering to wookland tileset / btw. i love your cliffs and water ). The colors in matt's SoM screenshot are a lot softer. Your woodland grass for example: light green blades on dark green background (thats hurting my eyes while playing). It might be better to make that color step more softer like light green blades on medium green background as you will see in the screenshot. please post your opinions about the already made tileset in the Woodland Tileset thread. this thread is about finding a concept for new tiles, not discussing old ones again. thank you. I really like the style there and the general concept of using what's available from the nature as such. I especially like those hay roofs. @Zelda 3: Zelda got a very unique minimalistic style. although that concept works well for zelda i would like to avoid using it as a reference. 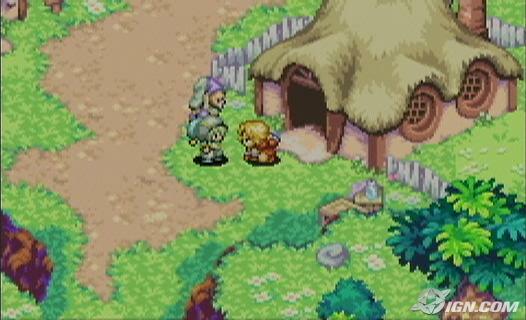 @Sword of Mana: the building looks very organic. i'm not sure if i am capable of doing something like that. but i can try of course. I'd like it to have houses made of wood of course, probably with a basement of stones, parts made of big rocks, as well as a rocky chimney, and a roof as in the picture. a concept like "i want you to make it look like on this (...) picture" is acceptable, too. Return of the african hut pics! But there are some elements you could use: the lack of finishing and polishing the materials into something smooth that fits perfectly and the usage of whatever is available. Crude, yet simple and effective enough. a stone base of about a half meter, then wooden board walls like on the first picture in my post and then straw roofs. when there aren't any other proposals i'll show you a first version soon. ...And more shading. I think the highlights on the rocks shouldn't be at the visual edge of the rocks, but at the top. Just imagine where the light would hit the rocks perpendicular to its surface. Also I think the boards should have a higher value and lower saturation. Last edited by Modanung on 11 Jan 2006, 16:47, edited 2 times in total. Hmm before concentrating on the details, I'd think about the structure, it seems to me as if the building is too weak, I'd make the vertical boards at least the same width as the rocks they stand on. Another idea crossed my mind, it would be cool to have blocks so we can make different kinds of buildings: completely wooden, rocky or mixed. about the colors: i'll adjust the colors when everything is finished. it would be pointless to do so before i can see everything together. about the tileset organisation: yes, i think that would be a good idea.